For a veteran singer-songwriter who has tugged at the heartstrings of listeners for more than three decades, it’s saying a lot that Kalamazoo singer-songwriter Brian Koenigsknecht considers his latest album the best of his career. “I feel that it is my best work ever and I really can’t wait to share it with the world,” Koenigknecht says of “From the Shallows to the Deep,” a melancholy but uplifting collection sparked by the ups and downs of coping with bipolar disorder and his father’s stroke while embracing Michigan’s robust music community. For Koenigsknecht, 43, the journey leading up to his third solo album actually started at age 9 when his father taught him how to play Neil Young’s “Heart of Gold” on guitar and harmonica. 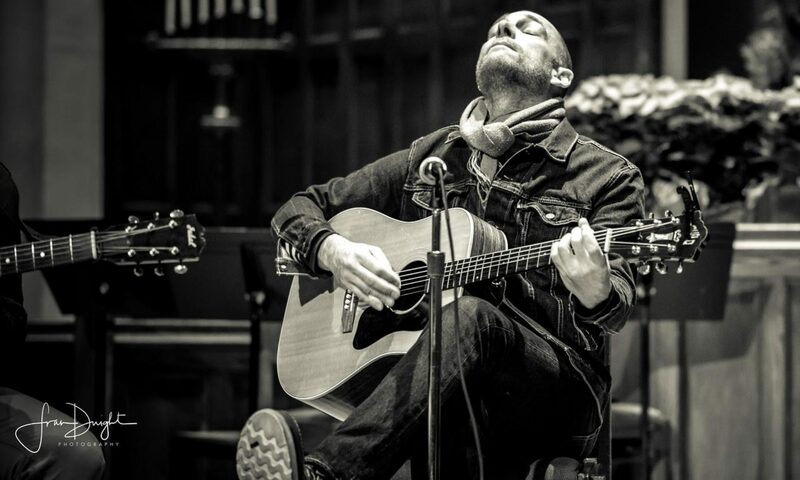 He grew up playing with the family at churches, festivals and schools, and started writing music and playing coffee houses while a student at Northern Michigan University in Marquette. He moved to Kalamazoo in 1998, establishing himself as in-demand act and as a member of the band Pillar to Post. His voice has been compared to David Gray and Ray LaMontagne, and he’s performed regularly at venues ranging from Bell’s Brewery to Kalamazoo State Theatre. “I write songs inspired by my life, the lives around me and a world that I am grateful for and feel is worth saving with the hope to move the listener to feel, to think, and to action,” he says, noting that his latest album actually started with a sobering concept. “My new album began as a suicide letter really: If I were gone tomorrow, how would I want people to remember me? I had almost given up on music, my family and life. Coming to terms with my depression and reaching out for help, I began to turn my life around,” he says. The resulting project of deeply personal tunes – recorded and produced by Brad Frank (Pillar to Post) at Knob and Tube Sound Studio in Kalamazoo – at once dark and hopeful. Assisting Koenigsknecht in the studio were several special musical guests, including Samantha Cooper, Megan Dooley, Matthew Borr, Carrie McFerrin, John Ford and others. “This new album was the source of therapy. I was writing stories or ideas and it wasn’t until I put them all together and found the constant theme of a darkness searching for light,” Koenigsknecht offers. Don’t miss a beat. Get articles like this right in your News Feed. Follow us on Facebook. This is a very interesting and wothry article. Menhnardisicg work of local artists is a win win program for the artist, The Nashers, but especially for patrons of the museum.